I’m so flattered! I was tagged by Gail and So knitpicky, thank you both so much! I read so many blogs and for various reasons, bring me a lot of happiness. I’m always inspired by a project I see or entertained by a story I read. So thank you, all of you who blog! Modified version of Rusted Root. 3.5 balls of Lana Grossa Cool Wool on size US #4 needles. If your state is part of Super Tuesday, get out and vote! I taught the 5, 6, and 7 year old girls how to knit. They did well for 30 minutes and then they wanted to play with the dog, play with the ball winder, play with the table loom, play with the water cooler…. Do you sense a theme? After about 40 minutes the 6 year old approached me and asked if I would watch her practice some more, so I’m hoping that maybe, just maybe the lesson had an impact on at least one of them. Oh and five years old is way too young to teach knitting with needles. 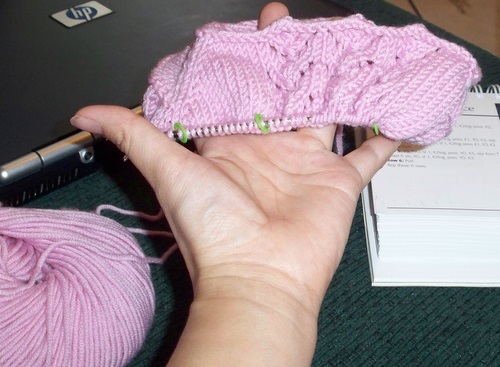 For future reference – finger knitting. I haven’t started any new projects because I have resolved to complete an original piece before jumping into a new project. The pressure of creating something from the bottom up is too much and I have frozen up. Brain block, call it whatever you want, the appeal to knit something is gone. I’m hoping it comes back and soon. Every time I see my needles sitting beside my yarn all dejected and sad looking, it makes me want to pick them up and cuddle. Come on brain. Be creative damnit!